Square Footage: Approximate 680 sq.ft. Inclusions: Fridge, stove, built-in microwave with range hood, stackable washer/dryer, window coverings and electric light fixtures. Bright, open & airy design for comfortable living/entertaining! Walls of windows in every room flood the suite with natural light all day long! Oversized and tiled west facing balcony with unobstructed city views! This is an oasis in the city to relax, rejuvenate and find your inspiration after a hard day's work. Owned parking spot & locker in an easily accessible location! Building amenities include: Convenient concierge, exercise room, party/meeting room, sauna, rooftop deck and security guard. Value, space, location and hip lifestyle! Exciting and vibrant location right at the core of Yonge & Eglinton! Just steps to the Eglinton subway station andevery amenity you could ask for! Welcoming front foyer with marble floors and an oversized double coat closet. Open office/den area overlooking the living room. Square floor plan so doesn't feel like a bowling alley. Open concept living/dining room fits full size furnishings, finished in warm & neutral tones. 2 sets of double slidingglass doors lead out to the brilliant balcony. Pristine light coloured real hardwood floors throughout. Open modern kitchen overlooks the dining area, includes multi-functional breakfast bar, tiled floors and ample cupboard space! Gracious master bedroom with a double closet with built-ins and large west facing window. 4 piece modern bath hasa separate laundry closet with stackable washer and dryer tucked behind closet doors. 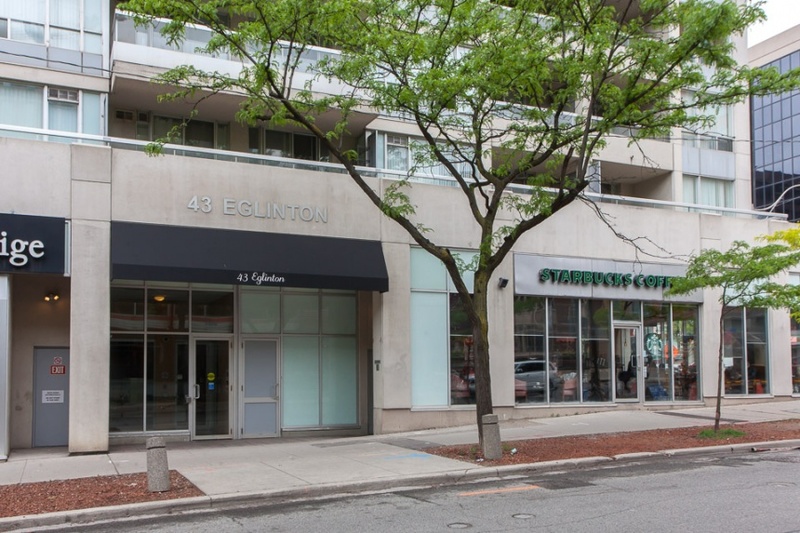 Superb Yonge & Eglinton Location! Affectionately referred to as "Young and Eligible" due to the many bars, restaurants, nightclubs and movie theatres that proliferate this intersection. The nearby ultra-modern North Toronto Community Centre has an indoor and outdoor pool, water slides, a gymnasium, a walking track, and exercise rooms. Eglinton Park is vast and adjacent to the community centre. Its facilities include: a baseball diamond, tennis courts, a wading pool and an indoor ice hockey rink -- home to the NTHA. Looking to join an exceptional gym? The Dunfield Club is right down the street offering a multitude of fitness classes and training programs. A shopper's paradise! Enjoy the plethora of local shops, restaurants, pubs, cafes, bars and specialty stores along the Eglinton Avenue and Yonge Street . It gets better every day! The Yonge Eglinton indoor shopping centre has recently undergone a major renovation and expansion. A mixed-use retail and office complex that has long been a landmark and pillar in the North Toronto community! Enjoy movie night out at the SilverCity in the Yonge & Eglinton Centre or Cineplex Odeon at Canada Square. The Northern District Public Library , on Orchard View Boulevard, offers programs for both children and adults. No need for a car with Eglinton subway station; just a quick 2 minute walk away, a hub for bus routes all over the city plus the Yonge-University subway line! The under construction Eglinton Crosstown Line will add convenience and value to this already premier location! Motorists can be downtown in fifteen minutes via Yone Street. Approximately fifteen minutes from the Allen Expressway and Don Valley Parkway.